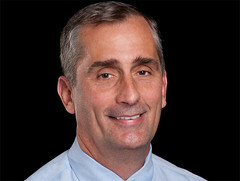 Intel's Board of Directors has accepted the resignation of now former Intel CEO Brian Krzanich. Krzanich was forced to resign after an internal investigation uncovered an inappropriate relationship between Krzanich and an Intel employee. The relationhip violated a company policy forbidding romantic relationships between managers and subordinates. Krzanich has been replaced by Intel CFO Robert Swan, who has been appointed interim CEO while the board undertakes a search for a permanent replacement. The Board believes strongly in Intel's strategy and we are confident in Bob Swan's ability to lead the company as we conduct a robust search for our next CEO. Bob has been instrumental to the development and execution of Intel's strategy, and we know the company will continue to smoothly execute. We appreciate Brian's many contributions to Intel. Krzanic started with Intel in 1982 as a process engineer at one of the company's fabrication lines before eventually rising to COO in 2012 before being appointed Intel CEO in 2013. Although Krzanich leaves Intel in good overall health overseeing a 120% growth since his appointment, his departure comes at a critical juncture for Intel. Completely blindsided by the rise of ARM-based smartphones, Intel failed to deliver an x86-based solution that was competitive and exited its Atom processor business last year. It is now facing further pressure from ARM-based servers, the rise of ARM-based notebooks running either Chrome OS or Windows 10, and a resurgent AMD. SANTA CLARA, Calif. – June 21, 2018 – Intel Corporation today announced the resignation of Brian Krzanich as CEO and a member of the board of directors. The board has named Chief Financial Officer Robert Swan interim chief executive officer, effective immediately.